For real. You definitely don't want these on your plate, Consumer Reports finds out. Sometimes organic just isn't available. So is it safe to go the nonorganic route if there's no other feasible option? While organic is always best if you're trying to protect your family from chemicals linked to breast cancer, non-Hodgkin's lymphoma, ADHD, thyroid problems, and other ills, Consumer Reports recently released a super-handy report that helps you figure out which veggies are riskier choices than others whenever you're in a position where organic isn't an option. 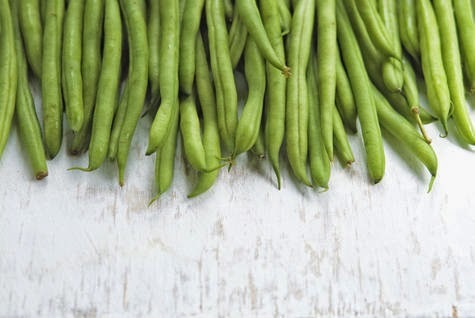 For instance, researchers found nonorganic green beans to be among the riskiest produce picks you could eat. In the report, veteran researcher Charles Benbrook, PhD, a collaborator on the Consumer Reports report and leader of the Center for Sustaining Agriculture and Natural Resources at Washington State University, had this to say: "Acephate, and its breakdown product methamidophos, on green beans was the No. 1 risk driver in 2013. That use accounted for around one-half of total risk across all pesticides and food." Because of this, green beans fall into the report's "very high risk" category. And the thing about green beans is that they are consistently contaminated with toxic pesticides. Looking at the measure of both the amount of pesticide residues found on the beans and the chemicals' toxicity, green beans have landed on the very-high-risk category nearly every year since testing began in 1992. If you find it's difficult to get your hands on organic produce, use these 5 great tips on what to do if organic isn't available.